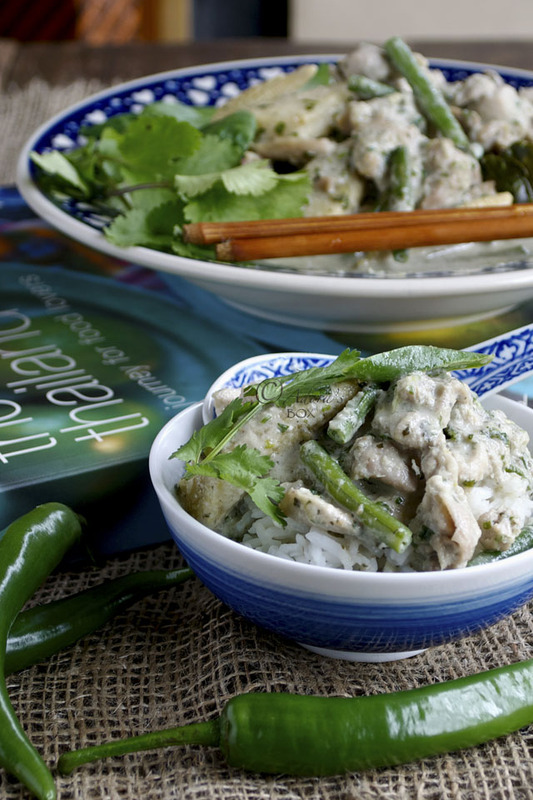 Thai green curry has become quite a phenomenon in the West. That creamy, aromatic and deceptively mild looking curry dish in restaurants packs a punch and gets your mouth in a fierce burning grip in seconds. Although I love the flavour, I can't bear the heat. I usually buy my green curry paste from the Chinese supermarket but find that I have to choose between flavour and heat. If I put the amount needed to get the right flavour, the curry ends up too hot. 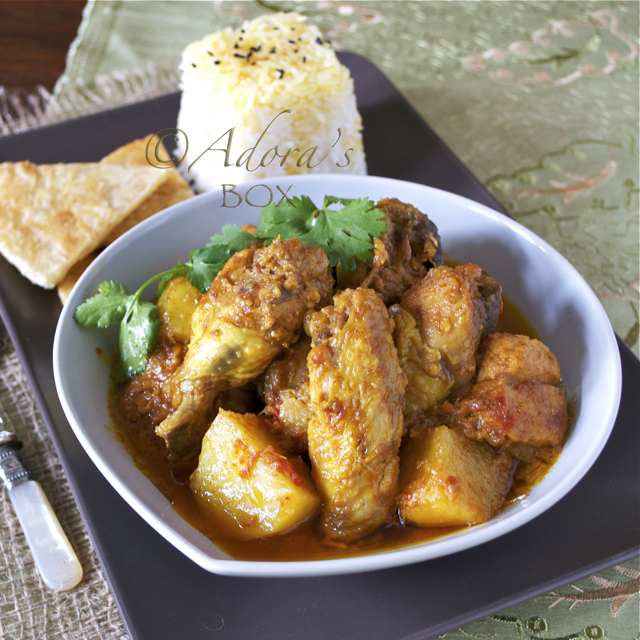 If I do not put enough, the heat is just right but the curry is lacking in flavour. The only solution is to make my own paste. 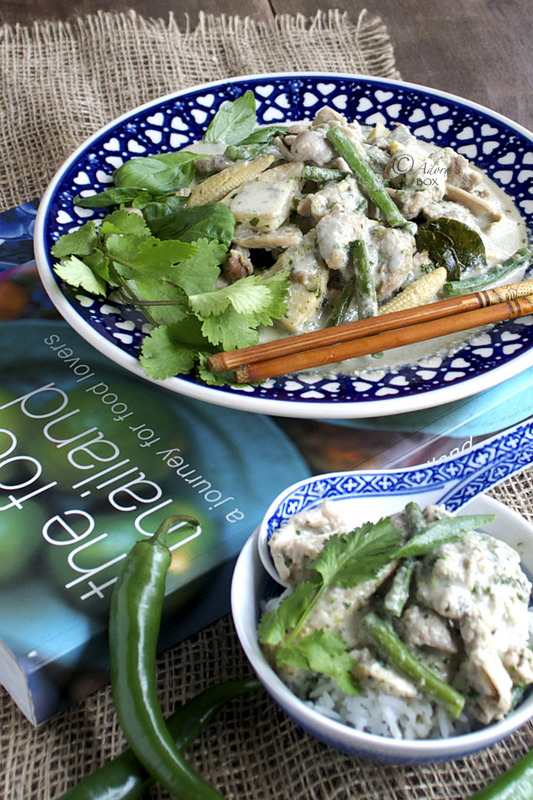 This is my version of Thai green curry. I have adapted this recipe from the book The Food of Thailand, a Journey for Food Lovers, so that all of us with palates still untrained to withstand extreme spiciness can enjoy its aromatic fresh flavours and goodness. Most of the ingredients I've used are available in any supermarket. Some Thai ingredients are difficult to find even in Oriental supermarkets so I have substituted readily available ingredients with similar flavours. The method of cooking is very interesting. The coconut cream is first cook until it exudes oil. This is to be used to "fry" the paste. I use reconstituted coconut powder for my cream and milk. It has stabilisers so does not curdle and exude oil. I added a teaspoon of oil to be able to use it for frying. It is a very quick and easy process once you've prepared your curry paste. 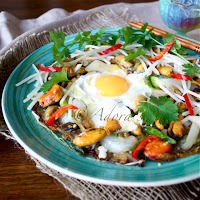 This is a beautiful dish that's to be thoroughly enjoyed, with rice and preferably with good company. I hope you like it as much as I did. 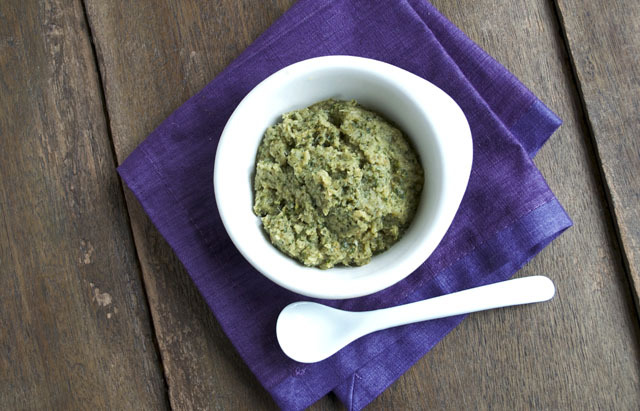 Put all of the ingredients in a food processor and grind to a paste. You will not need the full amount for this curry. The rest can be frozen. Heat up a wok. Add the coconut cream and oil and simmer until it exudes oil. Add the curry paste and stir fry until fragrant. Add the chicken and stir until it changes colour, about 3 minutes. 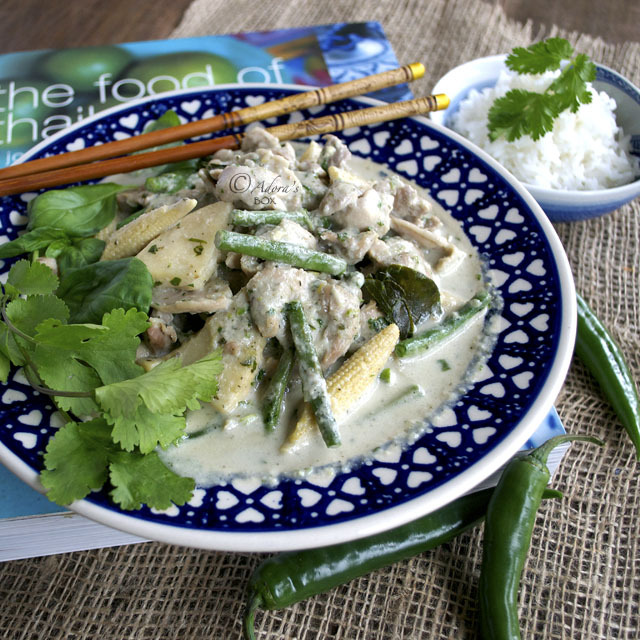 Add the coconut milk, kaffir lime leaves or grated lime zest. Bring to a boil. Add the vegetables, sugar and fish sauce and cook until the beans are crisp tender. Add the green chilli. 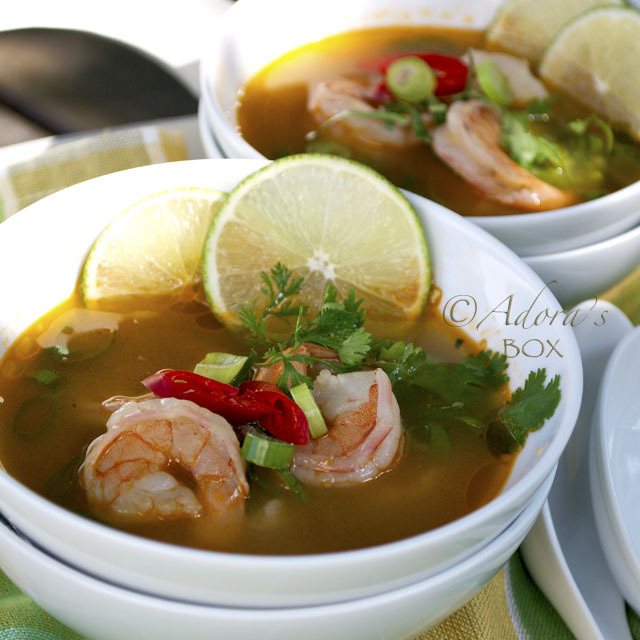 Take off the heat, sprinkle with the chopped coriander and basil leaves and transfer to a serving bowl. I'm in awe of that dish, and not just because of your amazing photography. 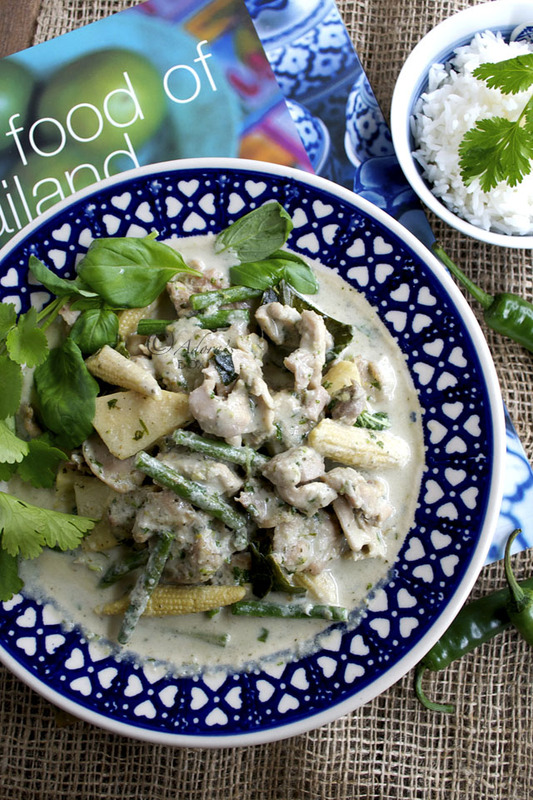 I adore Thai green curry. Pinned and saved for later use! Wow I am so impressed that you make your own paste! I have the same heat issue so I have to try this out. Thanks! I usually don't order green curry because it's spicy for me - but making it at home makes it possible for me to control the spice level (I hope?). This is beautiful plate of curry, Adora! You know how to plate the food using several colors. Beautiful!